When a restaurant business goes to the extent of buying-out its neighbours to convert the land into much needed car-spark space for its growing clientele, it clearly has something good going for itself. 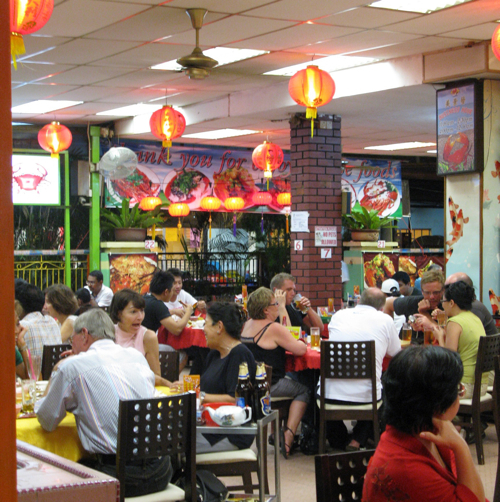 My family has been going to Mei Keng Fatt since the late 90s, hence ts the sort of place that I’ve grown up with through the years. What started off as a small, humble local village seafood restaurant in the outskirts of Kuala Lumpur is now a bustling empire that can easily handle upwards of 500 covers on a busy weekend evening service. 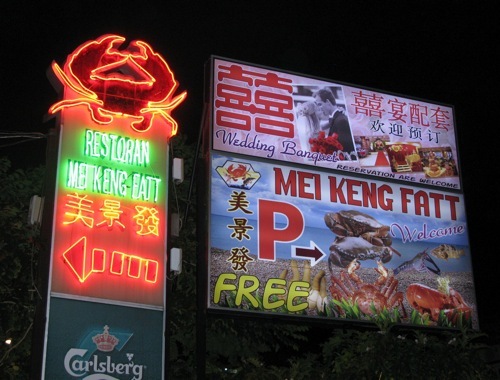 As the car park signage and neon lighting suggests, everybody comes here for one reason… CRAB. The cornerstone of MKF’s franchise, crustacea are ordered by the kilogram here which they prepare in a wide varierty of mouth-watering styles. 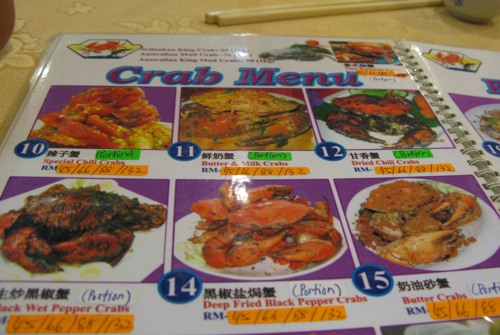 My mom usually takes care of the menu when we’re here, but if your Cantonese is as bad as mine, they now have a rather cute pictorial menu you can simply point at without the embarrassment of trying to describe to the waiting staff in a half-broken Cantonese… “I’d like 2.5 kilos of those Wet Saucy Black Peppery Crabs please…”. 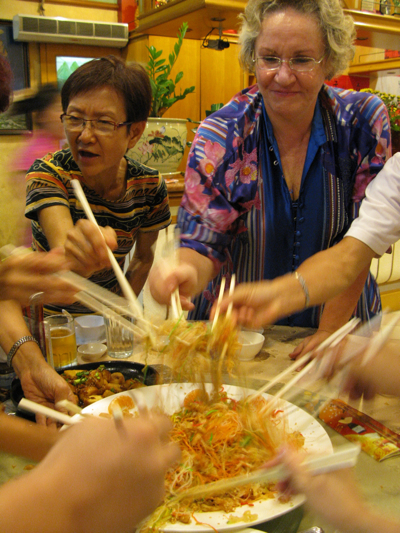 Before the main event however, it was Chinese New Year after all which called for the customary act of loh-ing (a.k.a mixing in a riotous fashion) Yee Sang with the family. I must say, I’m not an overly huge fan of this raw fish salad… for those who’ve never had it before, its simply a mix of finely shredded vegatables (carrots, radish, pickled green and red ginger mostly), spiked with raw salmon or jelly fish, and bulked up with some sort of Crunchy savoury condiment which I’m told is made from deep fried pork lard. The real fun though is in the loh–ing. They say the higher it goes, the more prosperous the year ahead, hence the chaos which ensues as family members try to out-do one another. The Chilli Crabs here are quite something. For me, its the mildly spicy, sweet and savoury sauce that makes this dish… the sauce is good enough to eat with plain rice alone, but even better with their deep fried Man Tau (white buns) which you can use to soak and lap up all the beautiful gravy. 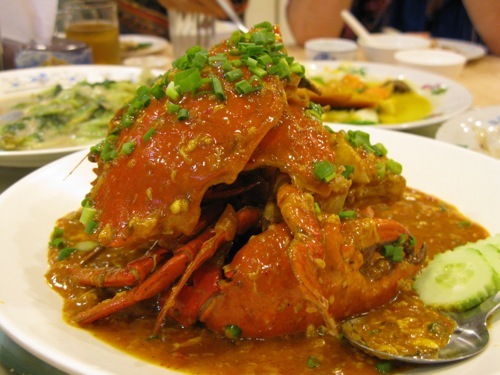 Add to that the plump, juicy, very very fresh crabs that are brimful with crab roe and you have a champion dish that can rival the best of K.L. and P.J’s Chilli Crab’s. Lets be clear on one thing… in the love-it-or-hate-it Marmite debate, I am well and truly in the HATE-it camp with a capital ‘H’. 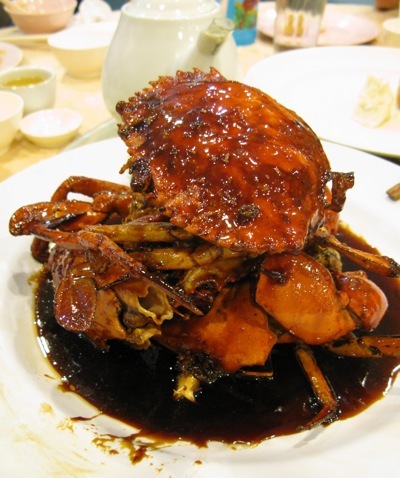 But if there is one occasion I ever sell-out and cross over to the other side, its when its cooked with Crabs, forming a sticky, sweet, fragrant caramel-like sauce. Irresistably, finger-licking good. MKF also do some very decent non-crab seafood dishes. I love the Drunken Prawns here. 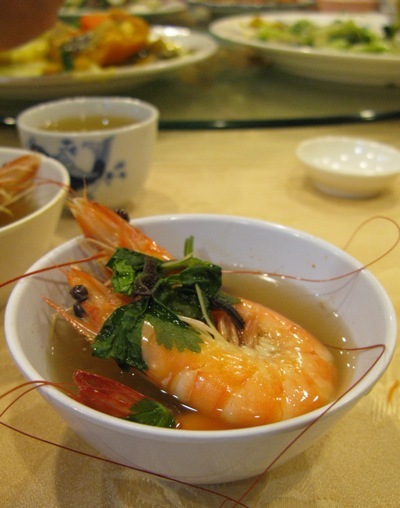 Cooked in Chinese-Wine and spiked with some strong ginseng, the fragrant, mildly bitter herbal broth forms a wholesome elixir that complements the natural sweetness of the prawns perfectly. The prawns themselves as with most things in MKF are as fresh as they get, and size-wise will put any of those so-called “King” prawns found in UK supermarkets to shame. 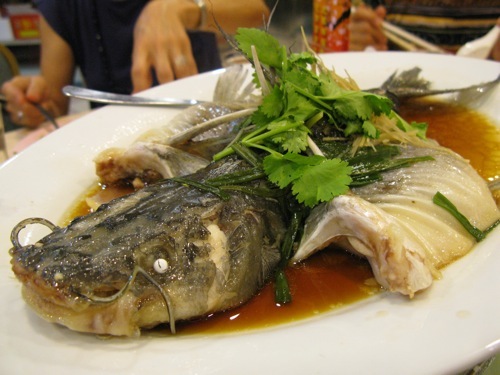 Our table of 12 also shared a whoppingly large Catfish… Eyes, Whiskers and the full monty steamed in a Superior Soya Sauce. A treat in small portions, but it starts to feel a little too oily and rich if you have more than 4 or 5 mouthfuls. wah glorious food at MKF and look at me loh hehing like crazy hoping the Tiger will bring prosperity!! Hi Ah Ee! Yes, you definitely took the Best Loh-Hei-er prize! Thanks for stopping by my blog. You are definitely ahead of your peers (i.e. my mother) when it comes to finding your way round the internet clearly =).